For some reason, I like Car Talk. Did I also mention I like getting my teeth drilled at the dentist and poking myself in the eye with sticks? I am a radio engineer, after all, and pain is a lifestyle. A 19?? 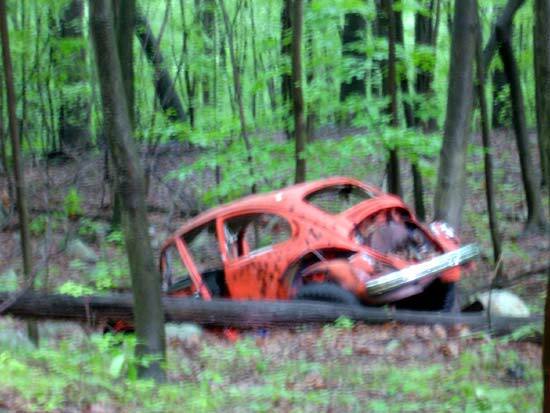 VW bug jammed between two trees. This one is at our FM transmitter site in Peekskill, NY. It has been there for several years, probably boosted from a nearby major metropolis and taken for a joy ride out to the country. I checked the trunk (the one in the front) for bodies, and there are none. So, when can you come and get it? Oh, you will need a chain saw because the trees have grown a little bit since the car was parked here.